Oranda goldfish are known for their wens that develop by age 2. If you are both aquarium enthusiasts, you may want to consider oranda goldfish as your first pets together. These beautiful fish develop large hoods called wens on their heads and are as friendly as they are attractive. Understanding proper care for these delicate fish is vital for their longevity. Educate yourself on the specific needs of oranda goldfish. Common goldfish such as the shubunken have flat, long bodies; but orandas have large, round bodies that make them slow swimmers -- they do not compete well for food with more active species. Their hooded heads are also prone to disease from bacteria and unclean water, so they are not tolerant to polluted water. In addition, unlike other types of goldfish, orandas must have stable water temperatures: not too cold, because they do not thrive if the temperatures in their tanks dips too low. Choose a tank suitable for your fancy goldfish. Orandas do best in tanks that provide plenty of room to swim. In addition, these hardy fish may reach sizes of 10 to 12 inches (25cm to 30cm) in length, making a spacious home necessary. A long or rectangular tank with capacity of at least 20 to 30 gallons (76l to 114l) will give your pets the space they need to thrive. Set up your fancy aquatic pets' tank with a filter and heater. Because orandas do not do well in dirty water, a filtration system will help keep their watery environment fresh and clean. An aquarium heater is a must for these fancy fish that are prone to temperature shock if their water temperatures dip too low. Decorate your oranda goldfish's tank carefully. If you choose to use aquarium decorations, you will prevent injuries to your fish by selecting items that do not have sharp or jagged edges. Because orandas like to dig, silk plants are the best option for their tank. Keep decorative items at a minimum to give your finned pets ample room to swim. In addition, line the bottom of the tank with a substrate of medium-size gravel to create a habitat with a natural feel that your orandas will love. Monitor the water in your orandas' tank to maintain an environment in which they will thrive. Because your fish will do best in warm water, keeping the temperature in their tank between 65 and 72 degrees Fahrenheit (18 to 22 degrees Celsius) is ideal. The pH balance, or acid and alkaline balance, in the tank should be maintained at 6 to 8; you can monitor the balance with a pH test kit. Performing weekly water cleanings by removing and replacing at least a quarter of the water in your tank will also help give your oranda goldfish the clean environment they need for optimal health. Feed your finned friends nutritious foods formulated for fancy goldfish. Oranda goldfish are hardy eaters and will devour a variety of flakes and pellets. By supplementing your pets' diet with live worms and shrimp, vegetable pellets and frozen or freeze dried foods, you will provide the nutrients they need to grow to their potential. Be prepared to give the necessary care that oranda goldfish require before you purchase them as pets. If you are not committed to the care they need, they will not thrive or live long lives. Invest in an aquarium thermometer to maintain adequate water temperatures in your orandas' tank. Add aquatic snails to your oranda goldfish tank to help keep it clean. 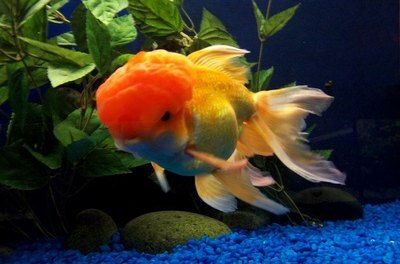 Never put your oranda goldfish in an outdoor pond. These fancy goldfish are too intolerant of pollution and temperature extremes to live outside. 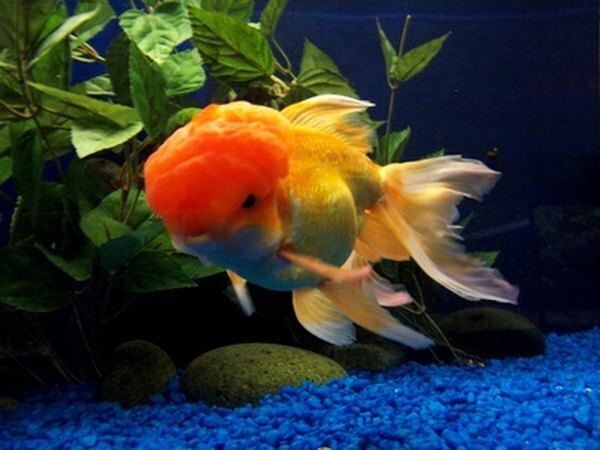 Do not let your oranda goldfishes' tank get cloudy or dirty. These delicate fish can easily develop bacteria-borne illnesses in unclean water. How Long Does It Take a Goldfish to Fully Mature?